This is a self reflective assessment looking back over the last two years of the on-line Digital Fine Art course at the University of Art London in which I participated in from 2012 to 2014. I feel that I worked hard throughout the entire duration of the course and achieved many of the objectives that I had first set for myself at the beginning. https://terrylongimagery.wordpress.com/ma-digital-project-proposal/ In terms of the amount of work, I surpassed the original goal of 150 published artworks on my MA blog to finish with 324 original pieces, plus some variants, I also created other images to illustrative my posts. As of the 29th of June 2014 I have published 209 posts. I should clarify that my objective was to have enough finished pieces of artwork to choose from for a printed book and also seven prints for display at the final MA show, which was also on my list of original ideas and goals. I now feel that I could have had a little bit more written material on my blog about my methodology, but I have been reluctant throughout the course in giving away some of my self discovered techniques in drawing and painting with light. I plan on doing that in the future with a How To Book on this medium. My chosen subject and theme for my MA was Mandalas that were inspired from many world wide cultures, all to be created with the medium of light. Due to my expanding experiments with light, and also broadening of work into other related subject themes, I later decided to produce three photo books that would show these other further developments that happened during the course. I limited the text, due to space, and also my time constraints. 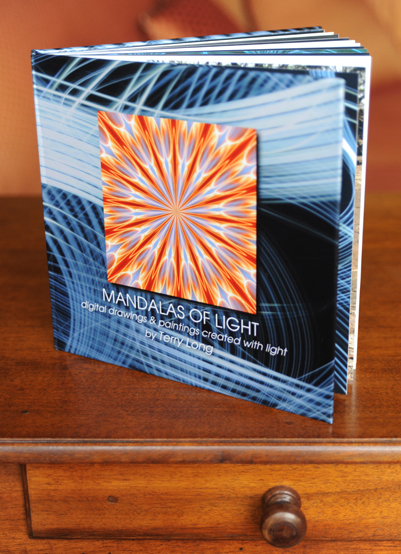 The first book, titled Mandalas of Light was based on my original idea, and displays mostly artwork from my first year in this course. 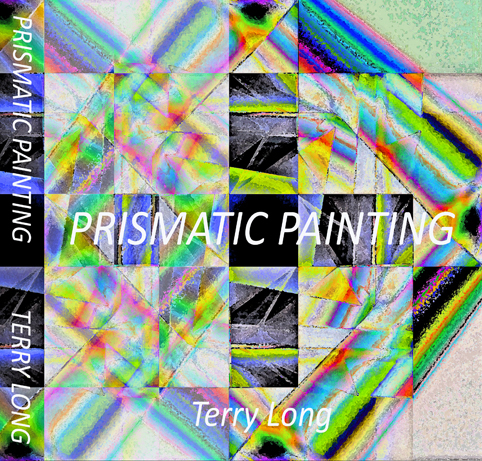 The second book, titled Prismatic Painting covers my experiments with using crystal prisms and sunlight to paint with and uses the theme of geometric abstraction which related to my mandala designs. Painting with crystal prisms was the most exciting discovery for me during the two years of this course, and it is my intention to continue with prisimography (my own invented word for it) into the very near future. 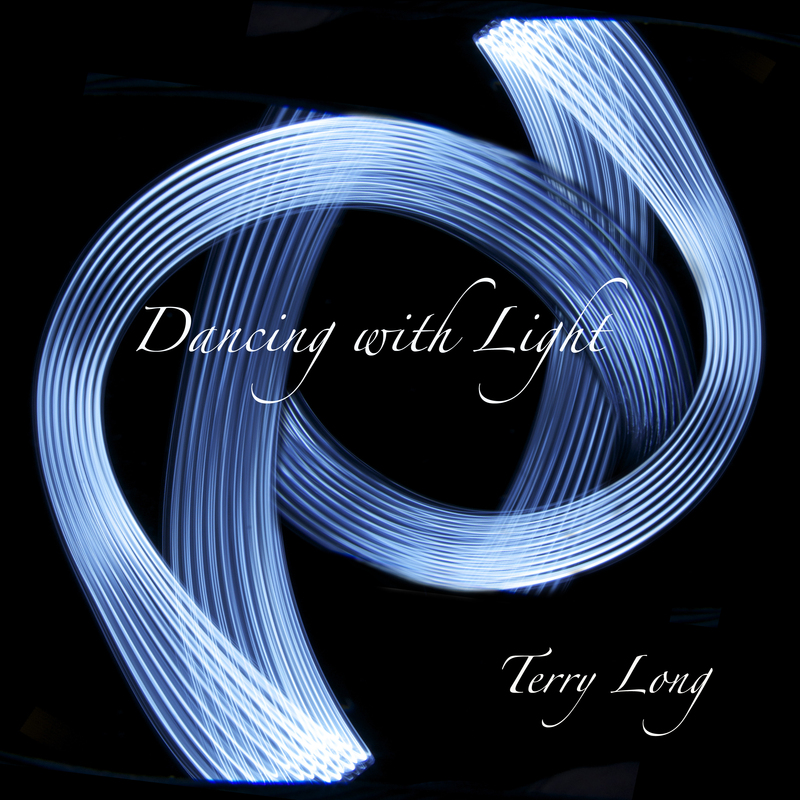 I think the third book, Dancing with Light, is my most successful of the three books, and displays my gestural drawings that were mostly created with LED lights. I feel that these images really show off the medium of light more clearly, and capture a purity of light, line and rhythm that give them a polyphonic quality. 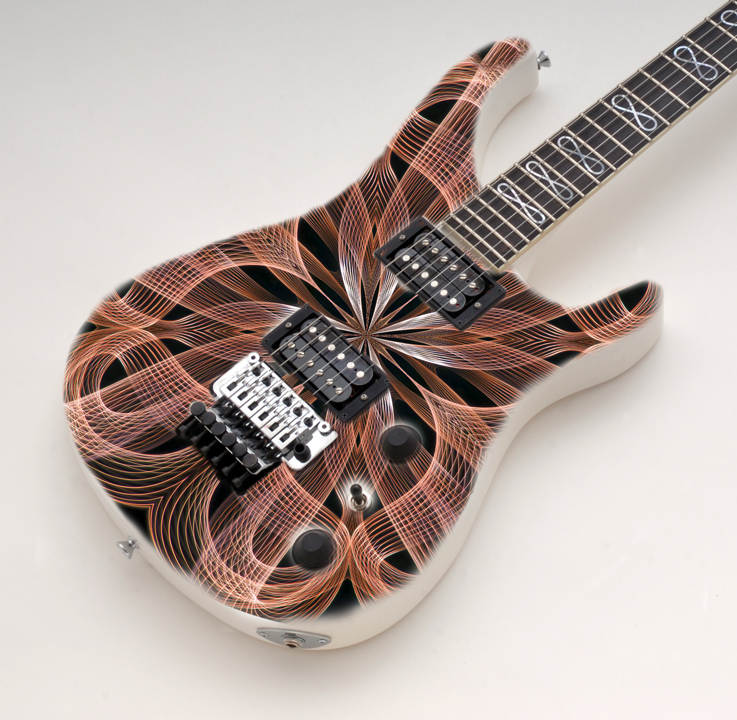 To obtain the rhythmic and musical qualities that I was seeking for these works, I had carefully selected music to both inspire and set the tempo while I worked. The body of work published in this book also relates very much to my MA research paper… https://terrylongimagery.wordpress.com/ma-research-paper-kinetic-drawing-with-light/ Creating the three books on-line was a great learning experience in of it’s self, and there were many hours in the beginning spent in frustration, and also working through the night to complete them in time for the show. One very helpful reflective tool was the slide show presentation, which helped me to decide which of my pieces I was going to print for the final show. Jonathan Kearney’s research paper on Reflective Learning and the use of blogs as a reflective tool made an immense impact and change to my own teaching techniques and professional development. In the Fall of 2013 I taught my first Art History course at the University of Redlands in Southern California where I work as a adjunct professor. I introduced for the first time into my department the use of student blogs into the curriculum. It was a great success, and I was asked to also teach a course on History of Design in the Spring of 2015 using the same methods. Participation in both the tutorials https://terrylongimagery.wordpress.com/tutorials/ and Skype on-line discussions became a very important component of the course for me, and led to much useful information from both tutors, guest speakers, and fellow students. 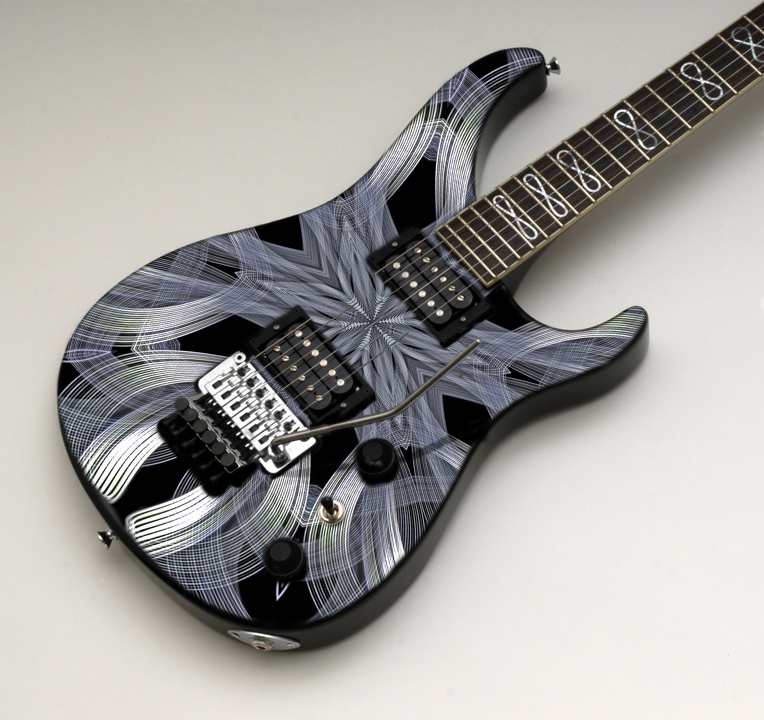 One of the results from my work done in the course is the strong possibility of my designs being used by Gj2 guitars, who is already a client of mine. The above designs were digital mock-ups I made on top of my photographs to show my client Grover Jackson who has recently approved of them. I have a much clearer view of where I am going with my art work, and plan on continuing to use the exciting medium of light in other forms, including sculpture and video. I feel that I now have a much stronger body of work to show galleries, publishers, and prospective clients. Apart from producing a few traditional books in the future, including a basic how to paint with light book, I would also like to produce a digitally active book using the medium of light. As mentioned, my teaching techniques and career changed and greatly improved due to this course and Reflective Learning, and it is my intention go on in this direction.